In my opinion, Kaerenmama - Japanese Mom with 2 active boys is one of the very well known charaben bento artists from Japan along with Akinoichigo and Asami. I have collected her 3 bento books. 2 books contain all of her bento works and the other book contains a collaborative bento works between her and Asami. The bento book shown on the top is the newest release. Not like the other bento books that I collected, this bento book is the first one that come with the bento tools (1 face puncher and 5 small cutters). This is cool and brilliant! The book contains a lot of cute characters from Sanrio, San-X, Nintendo DS, NHK, and lot more. 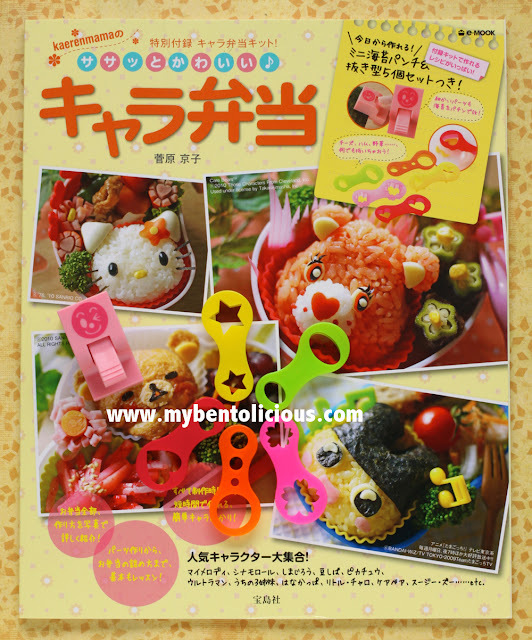 At the back pages, you can find so many tips and also tips using the free tools to decorate bento. Second bento book is a collaboration between her and Asami. This bento book also contains a lot of cute characters, recipes, and tips; plus attached at the back of the book you can find a lot of cute characters that you can copy with trace paper. Unfortunately many of the tips are using ingredients that are very hard to find in my country. 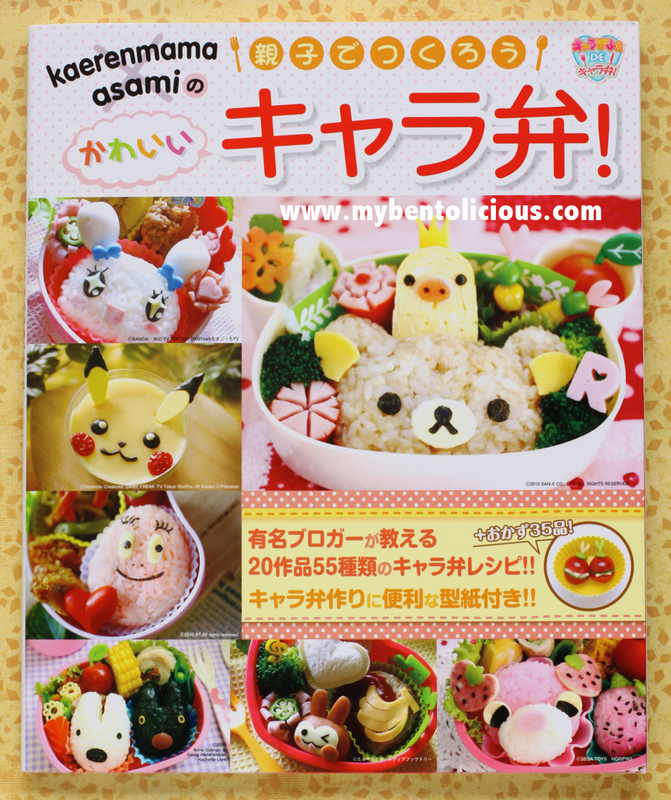 But still, the ideas can inspire us to make a cute bento. I bought her first bento book back in September 2009. Just fell in love with this book with all colorful pages and creative charaben works in it. All of these 3 books are very useful for me as they have step-by-step pictures for each bento, mainly pointed out the important point. With those pictures, we can easily understand especially for non-Japanese reader like me. I learned a lot about bento making especially charaben bento from these books. 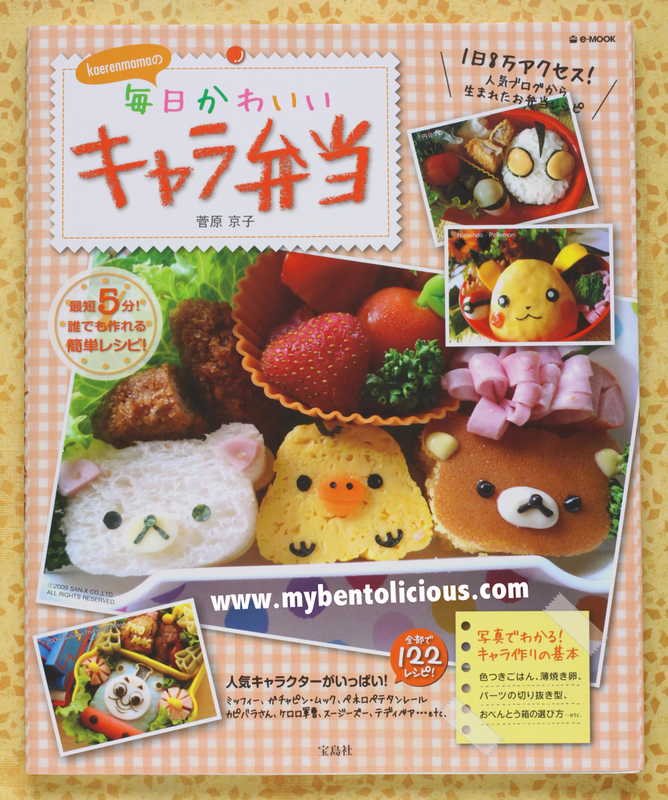 I do hope that perhaps someday Japanese charaben bento books will be released in English too. So we are not just looking at the beautiful pictures but can understand more about the recipes and tips for each bento in every page. If you are interested with Kaerenmama's bento works, you can visit her blog here. Her bento books can be bought from Kinokuniya Bookstore and Amazon Japan. She is so talented. Even the cover pictures are enthralling! Oh dear, I hope I can find her latest book in Kinokuniya!! So lovely! Wow! Book 3 with the tool sets are sooooo cool!!! Wonder if I can find them at Kino here. Thanks for introducing us to her. Now to find these books, they look awesome! Hi Lia..salam kenal ya..begitu nemuin blogmu ..my first comment is WOW!! It's great both Bento tools & ceated Bento boxes..keren abis deh! Pengen nyoba jg nih. BTW, mau tny nih..3rd book Kaerenmama ada ISBN ga ya? Thanks a lot! @fang fang : Thanks a lot Fang Fang! The ISBN number for Kaerenmama's 3rd book is ISBN-13: 978-4796679114.